Finally, a beautiful day! We celebrated by going on food safari, as Jen from Last Night’s Dinner puts it (I’m adopting that phrase, it’s perfect). We had visited the farmer’s market the day before and gotten a bunch of goodies, but on Sunday we drove out Chuckanut for further supplies. We got mussels and Kumamoto oysters at Taylor Shellfish, a loaf of farmer bread from the Breadfarm (plus what may have been the world’s best macaroon), and a completely gratuitous chorizo sausage from Slough Food (hey, as long as we were in there…) We took our haul home, fired up the grill, opened up some wine and settled in to eat shellfish. 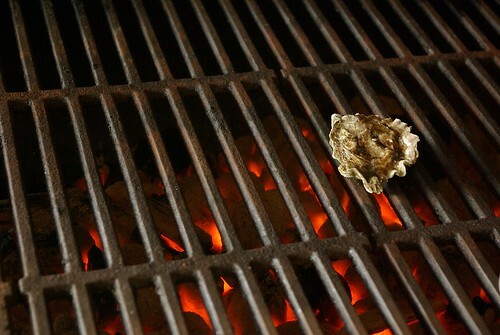 We ate most of the oysters raw, but then experimented with grilling them. I can’t believe we never tried this before! They weren’t actually better than raw, just different – less sweet, more salty – and I loved the hot broth left in the shell. 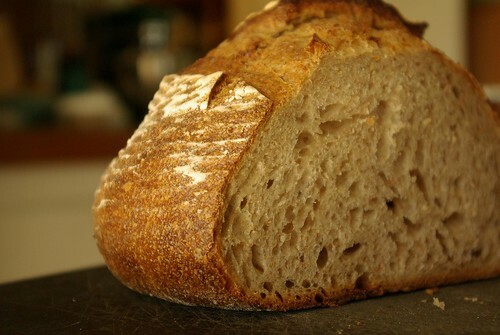 There was plenty of fresh buttered bread to go with. 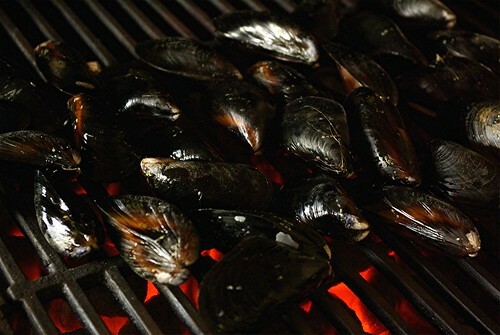 Next we dropped a bunch of mussels on the grill – that was a bit more exciting, I didn’t realize they would shoot boiling mussel juice all over the place. At the same time we melted some herb butter, and once the mussels opened we put them in a bowl and dumped the butter over. 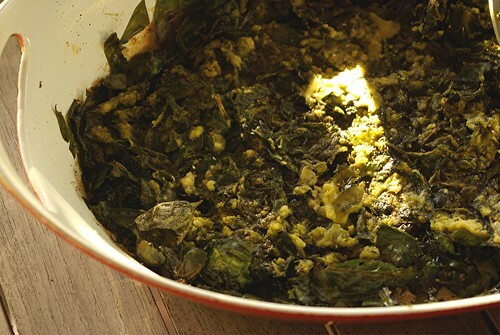 To go with the mussels I tried a new recipe for Provencal spinach gratin from Richard Olney’s Simple French Cooking. This is a book I’ve had for a while but have somehow avoided actually cooking anything out of it. This was a traditional vegetable tian approach: fresh spinach gets chopped, piled into a gratin pan, drizzled with flour, salt and olive oil, and baked for an hour. I’m not sure what it’s supposed to be like, but mine cooked way down and sort of deep-fried itself, so the spinach was crispy around the sides and top, with a very deep green flavor. Interesting. Not sure if I’ll do it again, but it went nicely with shellfish. It was a mighty good dinner, and we made the most of the fleeting good weather. At a friend’s house we observed an odd ritual, and you would have to experience Brent to realize this was not that unexpectedly odd. 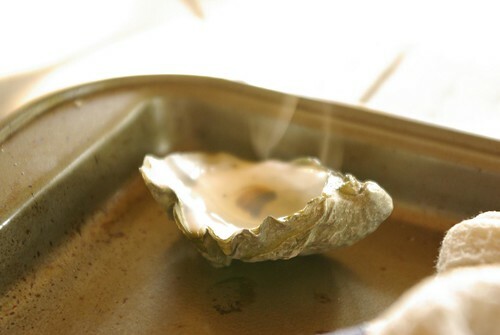 Once the oysters started popping on the grill, he would peel the top shell off and splash tequila all over them, slurping from the bottle between between flame ups. How he kept from igniting himself was an art form in itself. While the flames were dancing everywhere he would sprinkle parmesan cheese until melted and then hit it with a squirt of tobasco. Amazingly, they weren’t overcooked… just a little firm and the smokey briney sea funk and cheese and heat made for quite the filling morsel. Oh man! This post screams “eat me”!! 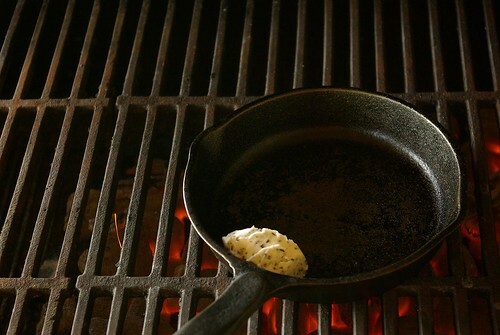 I would love to grill up some oysters here in Brooklyn, NY. 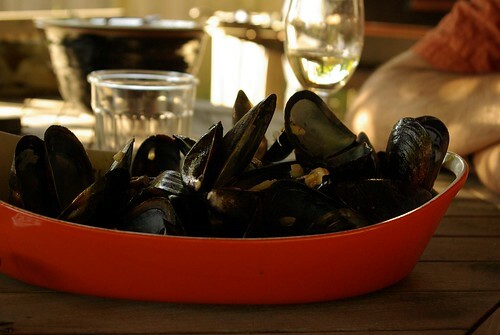 And nothing like mussel juice shooting everywhere – i actually got a mental picture. Those mussels were aggressive! I loved the way they just exploded open (fortunately no major injuries were sustained). 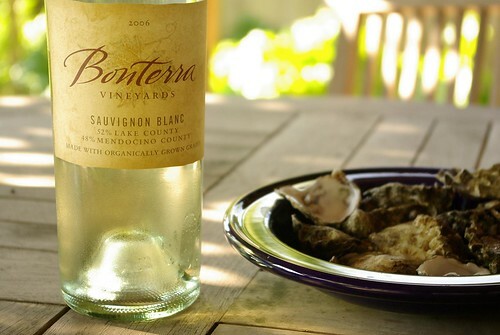 And I see many, many more grilled oysters in our future, now that we’ve discovered their joys.